IKO Cambridge IR in Charcoal Grey (left) and IKO Dynasty in Pacific Rim. Some things never change, right? Like roofing shingles. After all, they are still made with asphalt and surfaced with granules just as they have been for many decades. You might be surprised, but asphalt roofing shingles have actually evolved and changed—in some respects significantly, over time. Companies like IKO Industries introduce new roofing products not only to keep up with colour trends and architectural styles, but also to improve the products with advancing technology. Evolutionary—and sometimes revolutionary—improvements are often made. Let us take a look at how some key trends in the roofing and related industries have brought about important changes in the manufacture of asphalt shingles. In particular, we will focus on the two laminated architectural shingles comprising IKO’s “Performance Collection”: IKO Cambridge™ IR and IKO Dynasty®, both with the addition of ArmourZone®. To fully appreciate the value and benefit these two performance shingles offer today’s contractors and homeowners, we need to understand what went before and what prompted IKO, as well as other roofing shingle manufacturers, to innovate. While we usually associate the term “technology” with the computer or telecommunication industries, over the last few decades, roofing shingle manufacturers have developed and adopted some pretty amazing technologies into their manufacturing processes. In the past, multilayer laminated shingles were made offline, by hand. In order for the supply to keep up with the ever-growing demands of the homeowner market, however, manufacturers devised and engineered processes to produce laminated roofing products inline. The result? Laminated shingles are now available in much more elaborate designs and high-definition profiles or shapes, all with dramatically enhanced colour blends. This is especially true in the case of IKO Dynasty. The introduction of computer-controlled systems in shingle manufacturing plants has greatly improved product uniformity in terms of raw material use, shingle weight, product dimensional control, and appearance. Thanks to similar controls on the granule application system, manufacturers can now make their shingle colour blends not only more varied, but also more repeatable, resulting in greater consistency that helps reduce roof appearance issues and the headache of mismatched colour lots. IKO took this one step further with its own, colour-blending technology, which ensures consistency from batch to batch and even from one plant to another. All these improvements to the shingle manufacturing process have, over time, resulted in greatly increased speed and efficiency as well as a better product at more affordable costs. It is a big win-win for manufacturers, contractors, and the homeowners they serve. Asphalt roofing shingles were originally manufactured on a base material made from natural fibre (wool, linen, cotton, etc.) rags. Eventually, this rag base gave way to cellulosic reinforcements made with recycled paper, cardboard, and wood fibres. By the late 1970s and early 1980s, manufacturers began using fibreglass mats as the base material for asphalt roofing shingles. Fibreglass is an inorganic material offering the advantage over the old core materials of increased durability and weatherability. Here is how the mats are made at the fibreglass mill. Glass fibres of specific length and diameter are bound together with the help of stable resins and binding agents and then wound into large rolls or coils. When these fibreglass rolls arrive at the shingle plant, they are unwound and travel over a series of rollers as one continuous web. As the resulting fibreglass mat moves along, it gets thoroughly impregnated and coated top and bottom, with asphalt. This is the roofing shingles’ main water-resistant ingredient. The asphalt used is an end-product of oil refining, and it can be modified with certain additives designed to impart specific qualities. Although somewhat similar in origin to road asphalt, it is processed to a higher viscosity, which is necessary for the shingles’ performance. A fine mineral powder mixed with the asphalt increases the asphalt coating’s flow resistance, the shingle’s weather resistance, and enables the finished shingle to meet the highest standards for resistance to fire hazards. The most visible aspect of asphalt roofing shingles is the top surface layer. It consists of mineral granules that, at IKO, are quarried and crushed at its own granule plants. The resulting granules can be used as is—uncoloured—and applied to the part of the shingle you cannot see on your finished roof. Alternately, the granules can receive a ceramic colour coat and be embedded into those parts of the shingle you can see. They protect the underlying asphalt layer from the sun’s ultraviolet rays, which can potentially damage or cause it to break down, making the shingle brittle and less flexible. They provide colour and texture to create the beautiful roof seen from street level. IKO uses an exclusive, advanced colour-blending technology for some of the most stunning looks and effects available. Manufacturers also introduced granules containing algae-resistant additives. These specially designed granules were an important innovation as they helped inhibit the blue-green algae growth that can cause harmless, but unsightly, black streaks, stains, and discolouration. Nowadays, most asphalt shingles, including IKO Cambridge IR and IKO Dynasty, are manufactured with these blue-green algae resistant granules. Special ultraviolet (UV) stabilizers were also developed and added over the years to make the granules more colourfast to keep looking—and performing—great for longer. Spots of asphalt sealant are applied to the shingles, so they will bond together when installed on the roof. They are thermally activated by the radiant heat of the sun. Since the asphalt coating on the roofing shingle is itself a sticky material, the bottom side of the product needs to be covered with something to keep the shingles from sticking to the process rolls during manufacture and from sticking together in the package. In the roofing industry, this material is known as “backsurfacing.” If you look at the back of an asphalt shingle, you can easily see this backsurfacing is a fine mineral powder, often derived from limestone-type rock or fine sand. 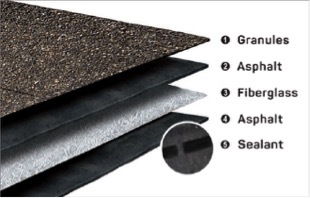 The final asphalt roofing shingle component is the release film. With sufficient solar heat, the small spots of asphalt sealant mentioned above are meant to bond the shingles together. But you do not want that to happen until the shingles have been installed on the roof. The release film’s function is to prevent the sealant asphalt from sticking the shingles together while they are packaged in the bundles. This film looks like a clear plastic tape, most often located on the back of the shingles. If you peel it back (which is not easy because it is not meant to be removed), you will see the coating asphalt underneath the shingle looks shiny and black, and feels tacky. The release film serves no real purpose once the shingles are out of the package, and, contrary to what some roofers might think, there is no need to remove it before installation. Its presence will not adversely affect the shingles’ installed performance. Since removing it takes time, installers can save that time and minimize labour costs too. Building on the strength of those advantages (described in detail below), an enhanced version of IKO Cambridge was made to be more impact-resistant by switching from 100 per cent oxidized asphalt to polymer-modified asphalt. The new shingle became known as IKO Cambridge IR. The initial objective in creating IKO Dynasty was to leverage our unique colour-blending process to create truly spectacular colour blends in response to homeowner demand for enhanced curb appeal. Standard Cambridge shingles get their colour blend appearance through the use a three-drop colour process. IKO Dynasty shingles are produced by specialized equipment that allowed for a four-drop color process. The fourth colour drop introduced on IKO Dynasty allowed for colour designs incorporating more colour contrast that really caught the eye and attention of homeowners. The other important innovation of IKO Dynasty—and later added to Cambridge IR as well—was the ArmourZone. An ArmourZone is a 31.7-mm (1 1/4-in.) wide nailing surface for correct nail placement reinforced by a tear-resistant band that provides even more fastening strength over a wider surface area of the shingle. Nails applied in this area are optimally positioned to help resist nail pull-through and shingle blow-off, even in high winds. Thanks to the addition of the ArmourZone, IKO Cambridge IR and IKO Dynasty shingles carry a limited warranty to withstand high winds of up to 210 km/h (130 mph). Initially in North America, practically all asphalt shingle dimensions measured 305 mm (12 in.) wide x 914 mm (36 in.) long. There are still many shingles manufactured to these dimensions, sometimes referred to as “Imperial size” dimensions. IKO was among the first manufacturers to introduce the “metric-size” roofing shingle, 336.5 mm (13 1/4 in.) wide x 1000 mm (39 3/8 in.) long. Then, IKO went even bigger, making IKO Cambridge, IKO Dynasty, and IKO Cambridge IR 349 mm (13 3/4 in.) wide and 1038 mm (40 7/8 in.) long. This increase in size provided the same roof surface coverage using fewer shingles. It is estimated the larger size allowed installers to lay a roof up to 10 per cent faster than with the smaller standard-sized shingle, providing a considerable time- and labour-saving advantage. Today, the dimensions of architectural shingles may vary from one manufacturer to another for several reasons, such as the physical limitations of the laminators, the dimensions of the fibreglass mat used (especially if the manufacturer makes its own as IKO does), the profile, cut, and shape of the individual shingles or simply to create a point of competitive differentiation. When IKO created its special “Advantage size” as described above for Cambridge, Cambridge IR, and Dynasty, it provided contractors with yet another powerful benefit. IKO’s “true square advantage” means contractors get exactly 9 m2 (100 sf) of coverage from three bundles. Comparable competitive shingles usually come up short (typically between 8.9 m2 [96 sf] and 9.1 m2 [98 sf]), obliging contractors to purchase extra bundles to make up the difference on an average-sized roof project. Thanks to this size increase, substantial cost savings on time, labour, and material can be realized. Plus, the larger shingles offer greater coverage and a more attractive exposure, making them very popular with homeowners and contractors alike. The following comparison, between IKO Cambridge IR and IKO Dynasty Performance architectural laminated shingles and a representative competing brand, demonstrates the difference. This comparison is based on a typical-size residential job (i.e. a 30-square roof requiring 90 bundles of shingles to complete). **Assuming it takes the average installer 8 to 12 minutes to install one bundle (Based on a general consensus. Rates may vary by installer). By using IKO Cambridge IR or IKO Dynasty shingles in their special Advantage size, a contractor can potentially save an hour or more on this type of job, in addition to the money saved thanks to the “true square advantage” mentioned above, wasting less material and using fewer nails. Now, let us take a closer look at the merits of both IKO Cambridge IR and IKO Dynasty laminated architectural performance shingles, both enhanced with ArmourZone. 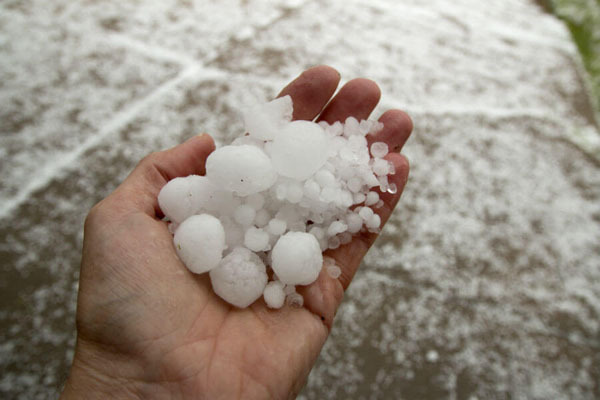 Hailstones are usually irregular in shape and can vary considerably in size and weight. Even the ones defined as “pea-sized” can potentially cause serious damage. Hail is one of nature’s most destructive forces. Some geographic areas are more prone to hailstorms than others. In Canada, Alberta is the province most often affected. According to the United States’ National Oceanic and Atmospheric Administration (NOAA), hail is most prevalent in Nebraska, Colorado, and Wyoming. Hail-generating convective storms are also common in Texas, Oklahoma, and Kansas. The largest recorded hailstone in the United States measured 203 mm (8 in.) in diameter and weighed just under 1 kg (2 lb). Hail damage varies considerably, based on many factors, such as the size and weight of the hailstones, the outdoor temperature (because shingles become more brittle in cold weather), and the angle at which the hailstones strike the roof. Hail can potentially damage a roof and other related structures, such as gutters and flashings. This damage may be seen as dents, pock marks, and distortions, as well as fractures, dents, and granule loss on roofing shingles. The angle of impact, when hailstones strike asphalt shingles, will leave a fracture or pock mark where the granules have been removed and the underlying asphalt layer is left exposed as shown at right. This can cause damage severe enough to warrant a roof replacement. Other signs of hail damage occur on gutters, as shown by the dents and distortion in the photo at left. The roofing industry and shingle manufacturers always focused on making their products more wind-, water- and fire-resistant. The insurance industry, however, was becoming very concerned because extreme weather events, including hailstorms, coupled with ever-increasing housing density caused property loss claims to increase. The industry teamed up with independent testing laboratories to devise a test to measure the impact resistance of asphalt roofing shingles. One of the tests developed—Underwriters Laboratories (UL) 2218, Standard for Impact Resistance of Prepared Roof Covering Materials—consisted of dropping a steel ball through a tube from a height of up to 6 m (20 ft) onto the shingle. The other test, Factory Mutual (FM) 4473, Impact Resistance Testing of Rigid Roofing Materials by Impacting With Freezer Ice Balls—involved firing ice balls at high velocity at the shingle. In both tests, the impact energy was designed to mimic the impact energy of naturally occurring hailstones. IKO was among the first manufacturers to introduce a laminated asphalt roofing shingle that met the established rating for impact resistance. IKO cautions that no shingle can withstand the force of hailstones hitting it at high velocity without some kind of potential damage. So, it is important to understand an impact rating is solely a relative measure of a shingle’s resistance to damage from impact. It is not to be construed as any type of expressed or implied warranty or guarantee of the impact performance of the shingle(s) by the manufacturer, supplier, or installer. For further details concerning the FM 4473 impact test standard, click here to download a PDF. IKO Dynasty architectural laminated performance shingles with ArmourZone are quickly becoming the shingle of choice among homeowners and professional roofing contractors. Here are just a few reasons for this. The last thing a homeowner wants to worry about is severe weather damaging their new roof and the resulting costs of repair. As such, Dynasty shingles offer limited warranty protection for high winds of up to 210 km/h (130 mph), thanks to their innovative ArmourZone technology. IKO’s exclusive, advanced colour-blending technology. A 4-drop process creates spectacular colour choices that are among the industry’s most beautiful blends. Bigger than most competitors’ comparable product. Three bundles will give you exactly 9 m2 (100 sf) of coverage. Enhanced curb appeal. Most competitors’ shingle tab exposure is 143 mm (5 5/8 in.). IKO Dynasty’s tab exposure is 150 mm (5 7/8 in.). That 6-mm (1/4 in.) difference may seem small, but the resulting larger exposure gives the finished roof a much more impressive look that homeowners love. Fewer shingles and nails required per square. When you use fewer shingles, you save time and labour. Those savings mean you can get on to the next project sooner. Dual lines, top and bottom, and 31.7 mm (1 1/4 in.) apart, guide installers to IKO Dynasty shingles’ wider nailing area for correct nail placement. Nails applied in this area ensure optimal fastening power for proper product performance. IKO’s modified bitumen sealant strip is formulated to be thick and aggressive to promote a strong bond and extraordinary performance with radiant heat from the sun. Market trends, climate change, environmental legislation, and other factors will continue to influence the roofing industry well into the future. IKO is committed to a high level of vertical integration and is a global leader in the manufacture of asphalt roofing shingles and related accessories. These include underlayments, ice and water protectors, vapour barriers, ridge cap shingles, and a host of other products for both the residential and commercial roofing and waterproofing markets. As a family-owned and -operated company for four generations, IKO is fully committed to constant innovation, investment in new technologies, and providing contractors with high-quality roofing products and exceptional customer service. For more information about IKO Industries and its roofing products, visit www.iko.com. All information listed in this section was submitted by IKO Industries.